The Light Rail Transit (LRT) industry frequently relies on custom-designed, programmable controllers to manage the tasks and processes required by their rail subsystems. With a variety of safety and automation functions included in each controller and a growing industry, these devices are becoming more complex every day. Added complexity translates directly into more complicated and expensive Bench Test Equipment (BTE). Transit Authorities need the ability to test each of their custom controllers. The established practice is for the original equipment manufacturer to deliver custom BTE for each new controller. This ultimately results in a substantial number of expensive test systems, each with a specialized use that cannot support any other function. By utilizing a common test architecture, programming language, and interface, ORBIS designs systems that provide fully functional test and diagnostic capabilities for multiple devices. This innovation significantly reduces both initial and long-term equipment costs, while simultaneously reducing unnecessary complexity in testing procedures and protocols. For example: ORBIS in developing a universal BTE system with a comprehensive set of instrumentation and software, allowed their customer to test six distinct electronic brake control units that are used on light rail systems. The system software includes communication drivers developed by ORBIS for the universal LRT BTE to send and receive messages via industry standards for LRT, including LonWorks® LonNet, WabLink™, Ethernet, USB, and GPIB (IEEE-488). Moreover, the soft front panel graphical user interface (GUI) allows the operator to quickly verify the connectivity to any given module under test and explore its functionality. This software was designed using National Instruments and Microsoft ® development environments, including LabVIEW™, TestStand, C/C++, and C#. The ORBIS Universal LRT BTE routinely performs automated self-tests of all instrumentation, including the interface test adapters (ITA) and cables. For example: each ITA and cable has a unique address which is verified prior to testing, ensuring that the BTE is configured properly every test, every time. The ORBIS Universal LRT BTE has designed utilizes modular hardware, which is a PC-based, open platform used worldwide for test, control, and measurement. The instrumentation is contained within a chassis that is capable of accommodating future testing requirements. This modular hardware architecture allows for easy expansion and updates to the system. The system utilizes this DMM card for voltage, current, and resistance measurements. The system utilizes this instrument for precise waveform generation in a variety of forms, allowing for more effective analysis during a test. The system utilizes this instrument for voltage and current output measurements. The system utilizes two PXI-2532 512-CrossPoint matrix switch modules. The modules are combined to create an 8×128 switch matrix used to dynamically route signals via module and unit test fixtures to the instrumentation. The system utilizes this relay instrument for testing load and system configurations. Test operators will find the ORBIS LRT BTE simple to use and ergonomically friendly. A retractable arm secures the operator’s monitor and keyboard, allowing quick access to data input and output when desired but maximizing the limited space when peripherals are not necessary. 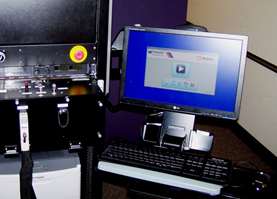 The included printer gives an operator the option to create hard copy test data reports. The digital results from each test are stored in a local or remote database, which allows quick access to test results when they are required. The data is not only easily accessible; it’s designed to be simple to interpret. Headers within the data identify test history and unit sources, and provide intuitive search capabilities.